A community site for convention bloggers? Hey it's a new name for the site, and this is the first time I've linked to it, but it already has one site in its Technorati cosmos. How about that! Proven once again: "Some people say all the good domain names are taken, my experience is that none of the good ones are taken." Salon: What bloggers bring to Boston. I was going for a hike this morning and at the trail head, there was a car with a very interesting license plate. 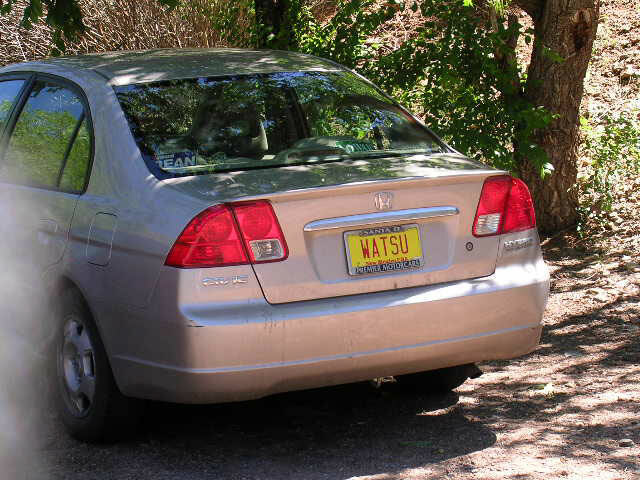 Watsu. Water shiatsu -- something I learned in massage school. Note the Dean sticker. Yeah, this is the right part of New Mexico. As opposed to the other part. Scott Koon on eating in Santa Fe. 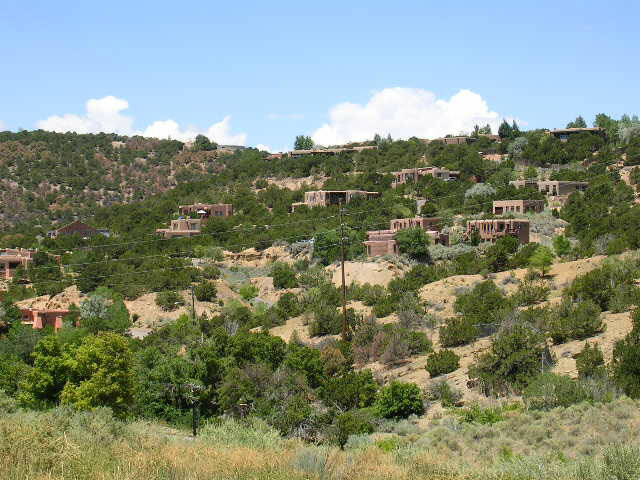 I took lots of pictures today, perhaps most typical, a hillside dotted with adobe-style houses, in the foothills of the Sangre de Cristo range of the Rockies. 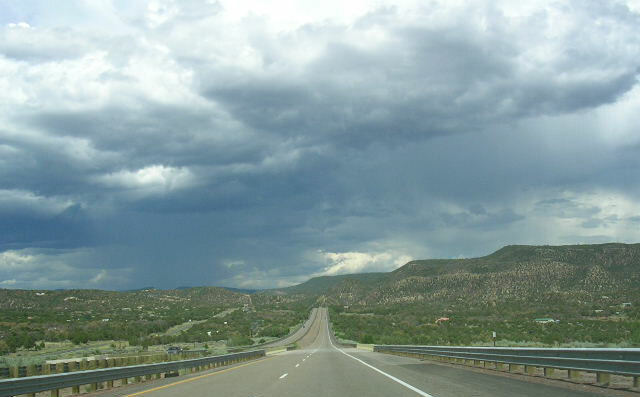 Santa Fe is one of those towns, like Denver or Salt Lake City, that is right on the edge of the mountains, the southern edge. In the summer, every afternoon a big thunderstorm comes through. This is what the clouds look like in advance of the storm. You see lightning strikes all the time. Bold! Ed Cone: "This weekend Lisa and I were cleaning out an upstairs closet and in old box of junk that had not been opened since we moved out of New York in 1989 I found the long Garcia tape, plus interviews with Bob Weir and Bill Graham." LA Times: "Both parties will have spent millions on their conventions in order to make their best case to the American people, and they hope that the mainstream media will simply turn on the cameras and step back." Okay, suppose I'm not a journalist, and the guy who wrote the LA Times story is. So what's his source on that statement about the hopes of the two parties? Does he have quotes from the heads of both parties (I guess Bush and Kerry). If not, did he get it verified by multiple sources? I heard that's how real journalists do things. I just realized that I know the author of that op-ed piece, Alex Jones, he's the director of the Shorenstein Center at KSG at Harvard. I had a very intense but interesting lunch with him and Rebecca MacKinnon earlier this year. It makes total sense he'd write it, he's a pro's pro, smart guy, but not very optimistic about citizen journalism, to say the least. I'm his opposite, I don't trust the pros to tell us what's really going on, I think they play footsie with the people they cover, and sometimes, they even cover themselves without saying so. Gotta keep an eye on those sneaky bastards, just like we keep an eye on the politicos, we citizens can help keep the pro journos honest. Jones commissioned the study of Trent Lott and the bloggers, as noted on Scripting News, in March of this year. BBC: "The new iPod is cheaper than previous models, while battery life has been substantially improved." JiWire's Portable Hotspot Locator provides "mobile professionals with an easy-to-use software application to find Wi-Fi access points." To William Safire, who says the lie that liberals are so angry about is the South Africa connect with Iraq about nuclear materials that Bush talked about in his State of the Union speech in 2003. Hmmm. What about the lie that there were WMDs in Iraq? And what about the lie that al Qaeda was allied with Iraq, that somehow our war in Iraq was part of The War On Terrorism? I thought the Times stood for discourse. He reduces our objection to something small and silly, and refutes that. It's kind of insulting to the reader's intelligence, which isn't something the Times does very often, which is why I like the paper. I thought Safire holds his job because he's smart, but he's acting dumb. I don't need the Times to publish this kind of school yard nonsense, I already get it from Rush Limbaugh. Here's the kind of article that the Times is famous for. A new surgical procedure to prolong the lives of people with not much time to live. It's an incredible article, not for the squeamish, but for people with heart disease in their families, it's a must-read. I've been referred to The Little Diner in Canutillo, TX, by Jay Bryant, who says if he could live anywhere, it would be Silver City, NM. Tim Bray: "RSS works well in areas where information arrives at irregular intervals, like news and publications, in which you don't want to waste time looking for information." Tim only acknowledges the flames. But I've been quoting him on Scripting News for years. Yeah I'm angry with him, no question about that. But I think we have to work together, kind of like the Republicans and Democrats. He led a really awful anti-Dave jihad. That always ends a friendship. He doesn't want to own up to it, be a man, and retract what he said. Okay, I accept that. But I also know that I've done a lot to help his ideas get heard by the influential and smart people who read my blog. And he's using all the work I did with weblogs, aggregators and RSS, and by the way, not giving me very much credit for that, either. 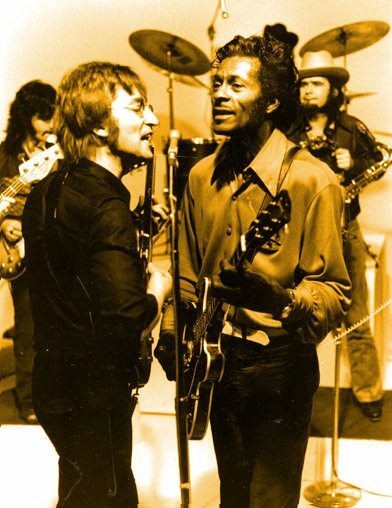 Maybe I'm Chuck Berry and he's John Lennon, but I never heard Lennon say a bad thing about his teacher. I guess Tim doesn't like that. But maybe it's time for technologists to start behaving like artists, and recognize the people they steal from? I heard, through Britt Blaser that Mitch Kapor says he's spending a career implementing my designs. How about that. Now we're going to open source Frontier, to give Mitch a run for his money. He's got much more money of course, but I've got more source. Britt Blaser: "I told Dave that Mitch had said that the software industry has spent the last 10 years following the trends that Dave Winer starts." Hacking Netflix: "The link for Blockbuster's upcoming online DVD rental service, Blockbuster Online, was leaked to Hacking Netflix tonight." Engadget: Netflix, Open up or die. 5/31/04: "It seems that Netflix would be just the kind of network service to give me an RSS feed I can subscribe to, where they would give me interesting articles about movies I just saw, or ones I'm about to see, or movies playing near my house that I would probably like, movies my friends liked, etc etc. They already do a bunch of stuff like that on their site, so why not do it in a feed?" Wish-list item: A database that lives on my laptop, constantly updated, with WiFi access points. Doesn't just have to be free access points. This is a project Intel could fund, with contributions from the commercial access providers. It wouldn't be that expensive. I bought a Sprint wireless adapter for my laptop, it works (where Sprint is available), but it's far too expensive. See note above. By the way, the WiFi was down at both Starbucks I went to in Santa Fe. I'd never seen that happen before. And the men's room had been vandalized in one of them. I said to the guy at the counter it's irresponsible to sell iced coffee without a working bathroom. I wasn't joking. Last update: Monday, July 19, 2004 at 8:27 PM Eastern.